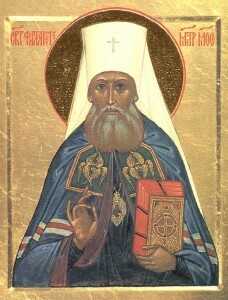 Editor’s note: Last week, Nicholas Chapman introduced three documents he found in the National Archives in London, under the heading “The Russian Orthodox Church in America and Its Clergy in 1865.” Today, we present the first of these documents — a letter from His Holiness Philaret, Metropolitan of Moscow, to the Ober-Procurator of the Holy Synod of Russia, February 26, 1865. Nicholas Chapman explains, “The author of this document was Metropolitan Filaret (Drozdov) who served as Metropolitan of Moscow for from 1826-1867. Metropolitan Innocent, since canonized as the ‘Apostle to America,’ succeeded him.” This draft translation has been provided by Matushka Marie Meyendorff. One final note: St. Philaret makes reference to a Christmas liturgy celebrated by Honcharenko in New York. This appears to have been the first Orthodox liturgy in the history of New York City (or, for that matter, the first known liturgy in the eastern United States). It is earlier than the better-known liturgy celebrated by Honcharenko a couple of months later (and discussed here and here). When the American spiritual leaders first showed the desire to have an Orthodox Church in America it seemed necessary for California but not for New York. Now a new outlook appears. Already a priest has received from the Holy Church of Constantinople the antimens and the Holy Chrism. He has arrived in America and on the day of the birth of Christ performed there the first Orthodox liturgy from the time of the discovery of America. Then he performed the baptism of eight Slavs and two Russians. He writes, “I found there seven thousand Slavs, three thousand Greeks and three thousand Russians, without a Pastor.” If this is true, it is a strong reason to have in America a Russian Orthodox Church. We are attaching to this a copy of the letter of Agapius Honcharenko written to the Editor of the newspaper “Orthodox Overview.” Won’t you take the decision if something should be done about this situation?